'Tis the season for twinkling lights, hot cocoa, mulled wine, and holiday shopping! Ever since the end of the spooky Halloween season, the festive holiday spirit has been simmering and getting ready to take center stage. Fortunately, for those who love the holiday season, the Christmas spirit is in full force here in Tokyo! While Christmas in Japan is usually synonymous with Kentucky Fried Chicken dinners, strawberry shortcakes, and romantic strolls through illumination spectacles, there is another side to the festive celebrations in the city. I present to you, the Roppongi Hills Christmas Market! 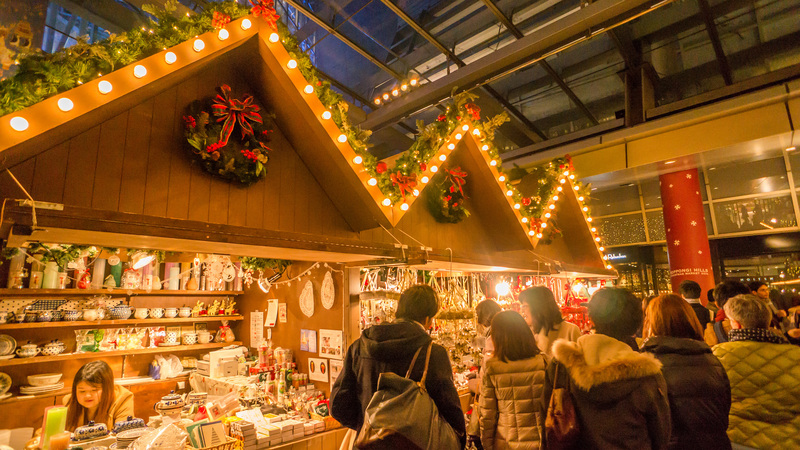 Located right in the heart of Roppongi Hills at O-YANE Plaza, the German-style Christmas market features a sparkling array of decorated food stands and specialty gift shops. As you weave through the crowd with a soft pretzel and steaming mug of gluhwein in hand, browse shop stalls overflowing with Christmas ornaments, Advent calendars, and seasonal knickknacks. Whether with a group of friends, family, or on your own, the Christmas market at Roppongi Hills will fill you with the spirit of the holiday season. The market is open daily from 11:00-21:00 (22:00 on Fridays, Saturdays, and Christmas Eve) and will close on Christmas day. Since the market takes place outdoors, I highly recommend wearing your warmest clothes so that you can enjoy the experience to the fullest. Whatever you choose to do during the holidays, enjoy the coziness of festive season!